Wai Lana makes an assortment of healthy, gluten-free, non-GMO, etc snacks, including chips, granola, and bars. They were featured in the product fair we had at work, so I got to try several of their items, although none are things I'd normally seek out. And ... for good reason. None of these were very good. "Made from nutrient-rich cassava, these gluten-free chips contain 30% less fat than regular potato chips. With an unforgettable crunch and an abundance of tempting flavors, Wai Lana Chips are a uniquely delicious, all-natural snack." 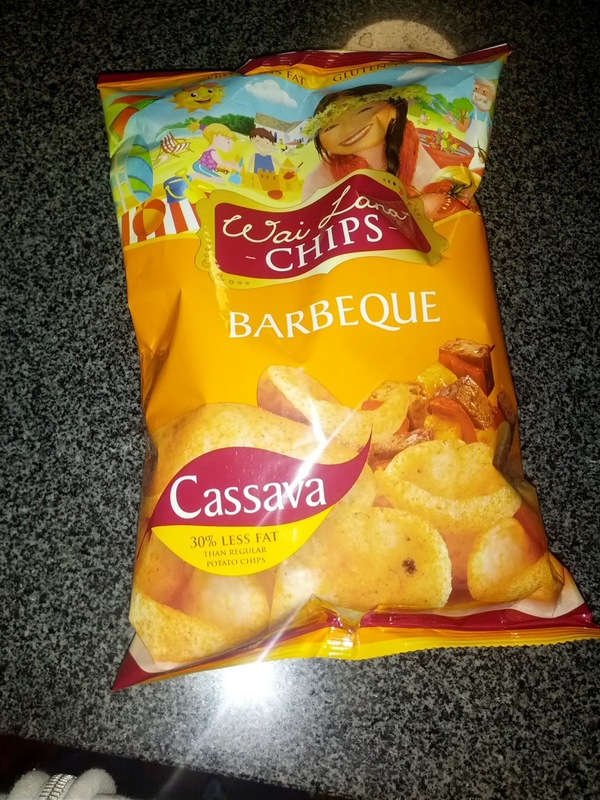 The chips are all made from cassava, rather than potato. They are gluten-free. 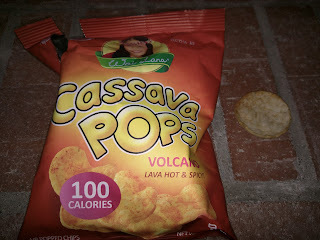 This didn't turn me off at first, since I do like the flavor of cassava. But ... there was just something really strange about these. The mouthfeel was all wrong in the flavors I tried. The chips are available in 6 flavors, ranging from natural to lime chili and thai curry. "Satisfy your snack cravings with these delicious, gluten-free cassava chips. They are popped with a little heat and pressure, not baked or fried—so you can enjoy all the flavor without the extra calories. " Cassava Pops are ... sorta like the chips. They are also gluten-free and made from cassava. I honestly have no idea what the distinction between these product lines is. The Pops are available in only three varieties: sea salt, luau BBQ, and Volcano. I love yucca, so, I was excited by the thought of these. Yuca chips! "Lava hot & spicy". Healthy too? But, they were just air popped chips that tasted a bit too much like chickpeas or beans for my taste, not like yucca. The "volcano" flavor was indistinguishable from bbq. 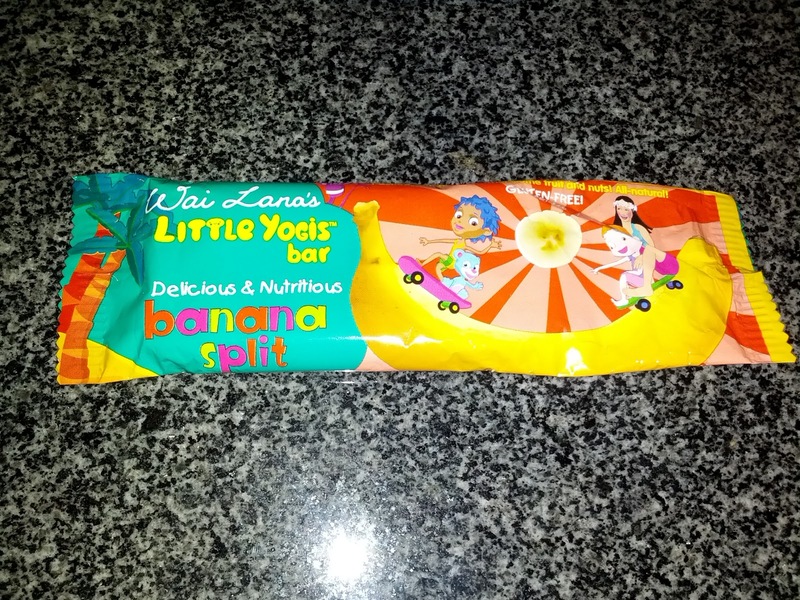 The bars are from their product line for children (hence the "little yogis" name), and have very appealing names, but not so appealing taste. They were discontinued at some point. 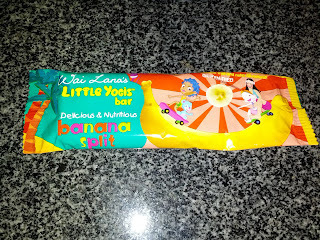 Banana Split Little Yogis Bar. Banana Split: Strange bitter taste (from carob? ), banana flavor comes through, kinda mushy and strange texture. Do not like. Oatmeal Raisin: Again, very bitter taste, very crumbly strange texture. Do not like. When I was younger, my family visited Hampton Beach every year for our annual vacation. The boardwalk is loaded with options for food, ranging from pizza to fried seafood to McDonald's. Of course, we usually packed a picnic cooler with the makings for sandwiches, so we didn't often get to explore the food options (well, besides the ice cream, slushies, and fried dough!) But when we did, it was to go to Sabo's Subs. Sabo's is located fairly far away from our family's specific spot on the beachfront, but it was never a question of if it was worth walking all the way to Sabo's. Once we were old enough to be able to walk there alone, we were often sent to pick up the food for the adults who didn't want to go all the way there. Such an important mission, to go get Sabo's! Sabo's sells exactly one thing: subs. 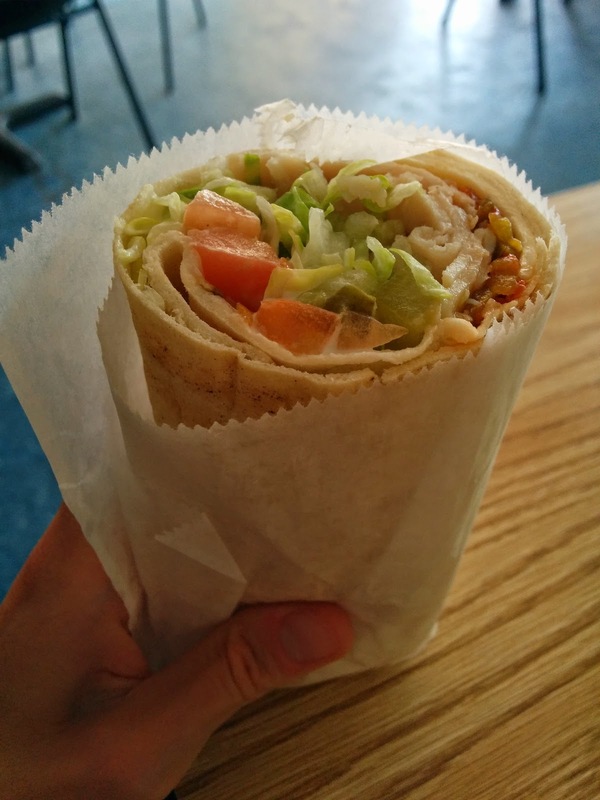 Well, actually, not subs, they are Syrian wraps, but 40 years ago, when Sabo's opened, wraps were not a thing, and thus, they had to call them subs so that customers would still come to get sandwiches. The choices are basic: ham, turkey, salami, tuna, italian combo, vegetarian. They come standard with cheese (only American is available), iceberg lettuce, tomato, onion, pickles, mayo, and their special secret seasoning. Hots and mustard can be added. Besides bags of chips and cans of soda, that is it, and that is all Sabo's has ever sold, in my years of frequenting the place. No frills, and certainly nothing like gluten-free options. You order outside at a window, are given a number, and then can go wait in the shade inside for your sub. There are tables inside, all self seating, or most people get the subs to go, since they are easily portable. The entire place has a serious beach vibe. Over the years, my love of Sabo's has remained largely unchanged, even when they went through some turmoil. The shop has changed hands several times, I believe they are on the third owners at this point. There were times where even in the height of summer, we'd venture there to find them closed, at 12:30pm, randomly. There were times where the subs would come so lazily wrapped that they'd fall apart immediately. Or that they would have so much mayo that they'd be soggy instantly. But it didn't matter. We loved our Sabo's. And then ... I moved away. First to college, then to graduate school, eventually to San Francisco. I didn't visit Hampton Beach for years. I turned into a foodie. I completely stopped eating sandwiches. Iceberg lettuce has not even been on a menu I've encountered in years. I stopped considering American cheese "cheese" years ago. Tomatoes are eaten only in-season, and only when they are heirlooms. And what is mayo? Don't you mean housemade aioli? Um yeah. I've changed. I thought that there was absolutely no way that Sabo's could actually appeal to me at this point, let alone live up to my expectations. I knew that I probably should leave it in my memories as that wonderful place, and not spoil it. But I went to Hampton Beach for the day with my mom and sister, for old time's sake, and there was only one choice when it came to lunch. We were going to Sabo's, for better or worse. To say I approached the ordering window with apprehension is an understatement. First, there was no line. Back in the glory days, the line was always visible the moment you'd turn the corner onto 'C' street. The wait always added to the anticipation. But where were the crowds now? Undeterred, my sister and I stepped up to place our orders. She went for her standard choice of the Italian combo. I hesitated and surveyed the options. When is the last time I had deli meat? Nothing sounded appealing. Ham? Salami? Ahh. I almost just went for vegetarian, but it is just the standard lettuce/tomato/onion/pickles that come on every sub, with nothing additional besides an extra slice of American cheese. So, I picked turkey, the one I always used to get. It had been years since I'd had a turkey sandwich. Spoiler: I loved it. I even wanted to return to get a second one for dinner, rather than going to a nice restaurant as planned. I can't wait to return, and you shouldn't either. Turkey with Everything (half). $7. The subs come wrapped up in paper, very portable, perfect for walking along the beach with. Normally one long sub, but I asked to have mine cut in half, so pictured here is just a half. I always find it easier to eat this way. The bread is Syrian bread, similar to a white pita, but thinner. It wasn't stale, tasted fresh, and I liked how the exterior was a bit crispy. Inside was a few slices of turkey and sliced white American cheese. Tons of shredded iceberg lettuce, and little cubes of tomato, onions, and pickles rounded out the fillings. I don't really have anything to stay about these components, they were as generic and basic as could be. Not offensive, but the tomato was totally flavorless, and iceberg really offers nothing to this world in general. Except, on a hot summer day, the water content of the iceberg is perfect, refreshing, crispy, cooling. The magic here is in the mayo and the special house seasoning. I have no idea what is in it. But it is delicious. And the mayo isn't thick, it is runny. As in, it seems like it is intentionally thinned out, or perhaps it is always just so hot that it is melting. Or maybe it is moisture from all the iceberge? Regardless, the mayo is very generously applied, and starts dripping out as you eat it. And this is a good thing. It keeps everything moist and creamy. Sabo's was precisely what I remembered. And, I realize that given my description, it sounds no different than something you could make with ingredients from just about any grocery store in 2 minutes. And it sounds like something I'd loathe. Yet ... I loved it. The bread and the seasoning are really the special parts for me, but there is also something about the way all the different components really do combine together to create a perfect sub. I'll be back. And I'll get this again. And maybe, just maybe, I'd even get a second one for dinner. Price for a full sub is only $7, which is crazy for a beach boardwalk where prices of even order of fries is $5.50. On my recent trip to rural New Hampshire, I did something I have previously sworn off. I attempted higher end dining. My time in New Hampshire did have some culinary highlights, including some of the best muffins I've ever had, and lots of amazing soft serve ice cream, but the other food I ate during my trip just really wasn't ever good. 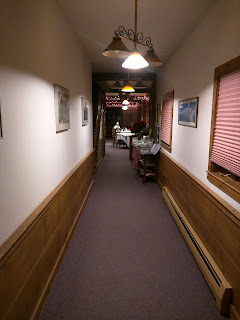 Long ago, I gave up on eating at nicer places (although I did have a couple fabulous meals at Home Hill Inn a few years ago, before they closed), but on my last night in town last year, I wanted to have some nice time with my family, my little sister included. She lives 45 minutes away from my parent's house, on a farm with horses, and a house full of cats that I'm horribly allergic to. She can't came elsewhere for dinner due to her evening farm chores, and I can't have dinner at her house due to the cats. If I wanted to spend any time with her, we had to go out, and it had to be near her house. Last time I was there, we went to her favorite place, Flying Goose. I hated it. There was nothing on the menu I wanted, and the food wasn't good. 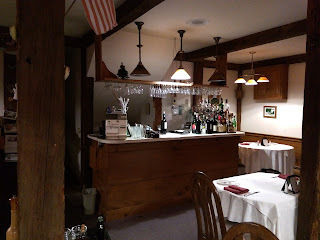 This time, I did some research, and picked a place myself: Millstone at 74 Main. There aren't tons of options in the area, but they had good reviews, and the menu actually appealed to me. Of course, given the limited options in the area, my entire family had been there several times before. My sister said I wouldn't like it, and that she had never been impressed. My mom said it was "nice". Given lack of other options, I still voted for it. The short version? Poor service. Overpriced. Some dishes highly mediocre and others quite bad. They tried with the presentation, but are living in a past decade. I won't be returning. My family was right. I never quite figured the place out. It seemed like they were trying to be higher end dining, except there were way too many rough edges. The decor certainly wasn't fine dining, no tablecloths, but they did have cloth napkins. Lots of wood elements and a slightly rustic setting, except with ugly table tops. The space was light filled with skylights up above, and plants hung about to bring some nature in. 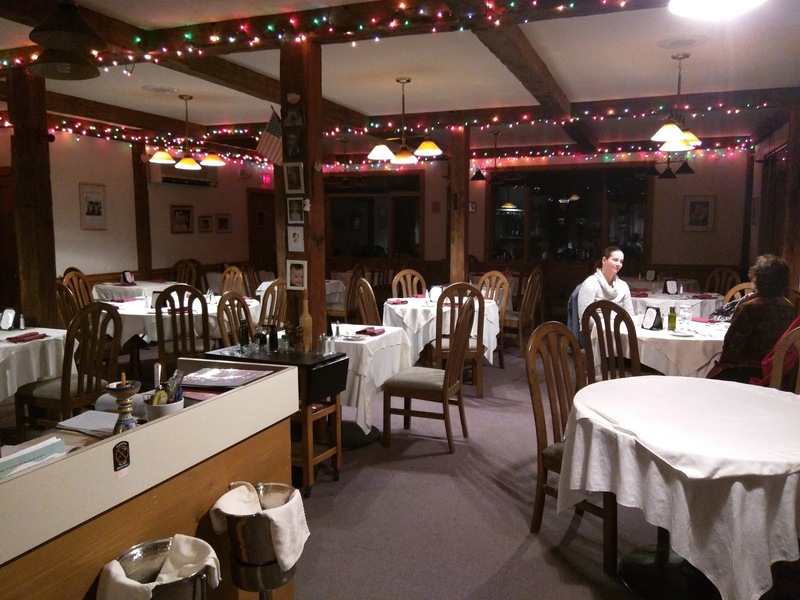 The restaurant filled several distinct rooms, and there was also a bar area. Service was really poor. I spent much of the night with an empty water glass. I couldn't get my server's attention to fill it. Even once I asked for more water, it took forever to come. When my mom ordered a second glass of wine, I think it took 20 minutes to arrive? We all assumed it had been forgotten, and so much time had elapsed that my mom said she wished it had been. My sister was delivered fries with no offer of ketchup, and it took two tries, and probably 10 minutes, before we were ever able to get some. Some dishes were cleared when we were done, others weren't. The table piled up with a random assortment of dishes and cutlery from previous courses. They did make sure everyone was served at once, often using several waitstaff to serve a single table. The average customer age was shockingly high. 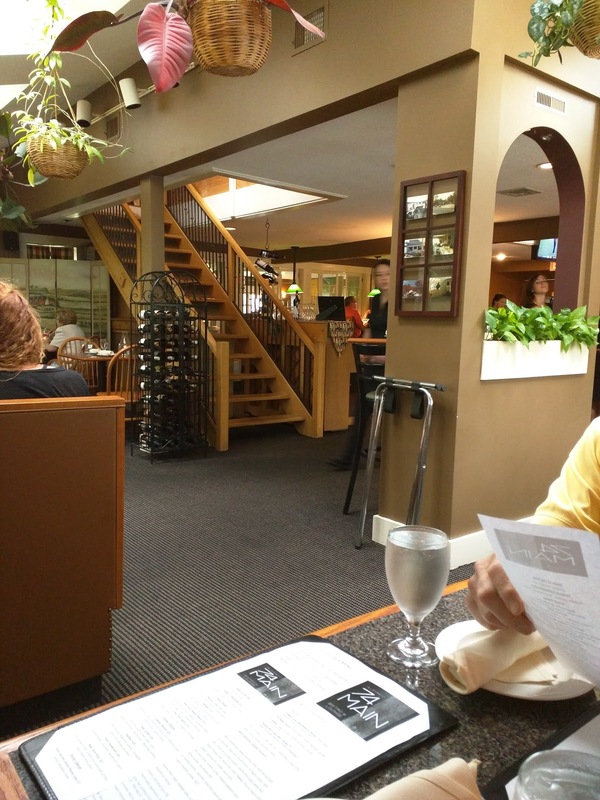 I honestly thought I was dining in a retirement home. I have no idea if this is normal? The menu, although fairly classic, did peak my interest, due to some good sounding seafood options. I was really missing seafood. And the kitchen was trying, you could see it in the plating and excessive garnishing. Not successful, but, they tried. The wine list was large, with a rather insane number of wine available by the glass. I don't really understand why, as it is clear they don't do that high volume, and clearly don't have argon tanks around. Not realizing quite the level of restaurant I was at, I did ask for advice on selecting my wine, outlining a few parameters, until it became obvious that my server had no idea, and probably didn't even know the difference between a dry or sweet white wine. I thought that given the way the rest of the menu read, the price point, and the extensive list that they'd have a decent wine program. Um, no. The wine I wound up with was awful, horribly acidic, and even my mom, who would readily tell you that she has no real opinions on wine, didn't want anything to do with it. The menu starts with a selection of appetizers, soups, and salads. Appetizers were a mix of seafood classics like crab cakes, oysters, and shrimp cocktail and crowd pleasers like meatballs, bruschetta, and chicken wings. The daily specials menu included a soup of the day (tomato), a flatbread (buffalo chicken), and four small plates, including a rather out-of-place ramen. The soups and salads were pretty standard. Once we ordered, bread and butter was brought out. The rolls were served warm, each split in half into triangles. They were soft and doughy, and reminded me a bit of the pizza dough rolls at my favorite Italian place in my hometown. Not amazing, but not bad, and I of course appreciated them being served warm. The butter that came alongside was in foil wrapped packets, fairly tacky. I guess this eliminates waste, but I haven't really ever seen foil wrapped butter at a restaurant that is trying to be fairly fancy. 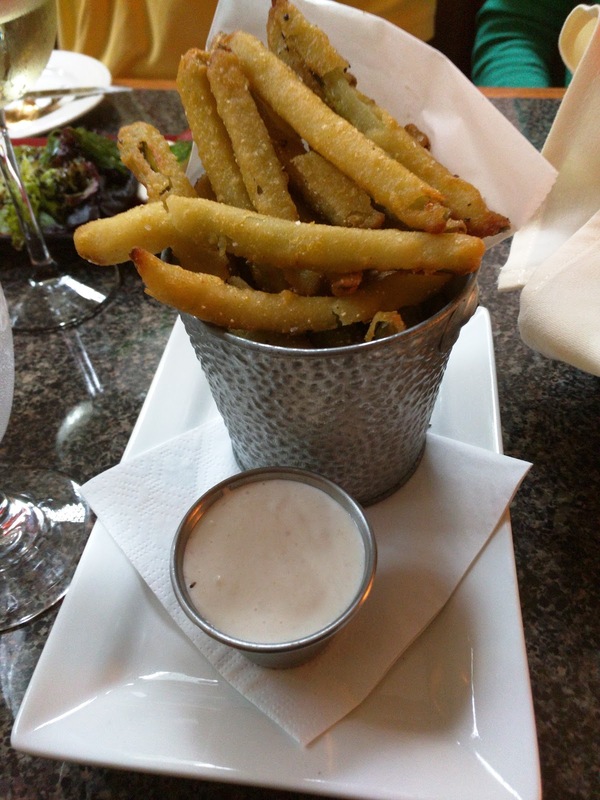 Pickle fries with horseradish mayo. $8. Even though we were all ordering individual appetizers, my sister insisted we order the pickle fries for the table as well. When the fries arrived, I actually thought there was a mistake, that these were regular fries. I expected pickle chips I guess, not thin spears? My mom took the first one. "Interesting", she said. My sister eagerly dove in, as she was the one who really wanted them. "They taste better than the Hooter's ones!" she proclaimed. I had all sorts of questions at this point, but, I didn't press. I tried one myself. They were piping hot and fresh. The coating was really crispy. Nice execution here, but ... a thin pickle strip, battered and fried, just didn't do it for me. I like fried stuff, I like pickles, but, this wasn't my thing. The horseradish mayo was super flavorful, and I love having a creamy dipping sauce, although I think something more like a McDonald's style "special sauce" would go better with the pickles. My dad however was the surprise. Not a man to try new things, and not one to comment on his food, he tried one. And then another. And another. He went back for more and more. "I quite like these!" he declared. Woah. So, overall, not my thing, but definitely an interesting dish to try, and I can't fault the fry job. Probably my third favorite bite of the night. $8 price seemed fine. Tomato and mozzarella Salad. $10. "Crispy basil, balsamic reduction, olive oil." 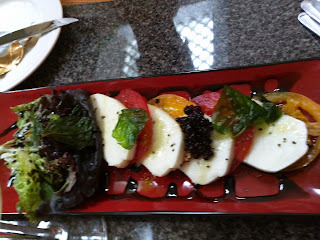 My father opted for the tomato and mozzarella salad, with slices of two colors of tomatoes and mozzarella, interleaved. It also had ... lettuce? A large slice on one end of the plate, and torn bits on top. Interesting. My mom really liked the tomato she snagged from him. I didn't attempt to steal bites of this, since I know my dad doesn't really like sharing and I wasn't that excited by it, except there was one component I was puzzled by: the little pearls on top. Yes, at a first glance perhaps some kind of roe, but, obviously not. 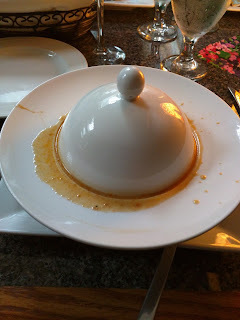 Now, a more culinarily advanced restaurant would love to play with spherification, and the idea of balsamic pearls sounded awesome to me, but, I doubted that this little restaurant in middle-of-nowhere, NH was experimenting with molecular gastronomy. My dad didn't want to go near them, fearing some kind of roe. My sister tried them, I tried them, and we couldn't figure out what they were. No, not balsamic sphere, they were actually solid and hard, some kind of vegetable or fruit? They had no flavor we could distinguish. Really strange. The plating was a good indicator of what was to come. They tried to make things look nice, but everything was a bit dated, and the extraneous garnishes (lettuce here, herbs later) got old fast. $10 seemed a bit high for a salad in New Hampshire. "Young arugula, goat cheese, pumpkin seeds, quail egg, and a buttermilk dressing." 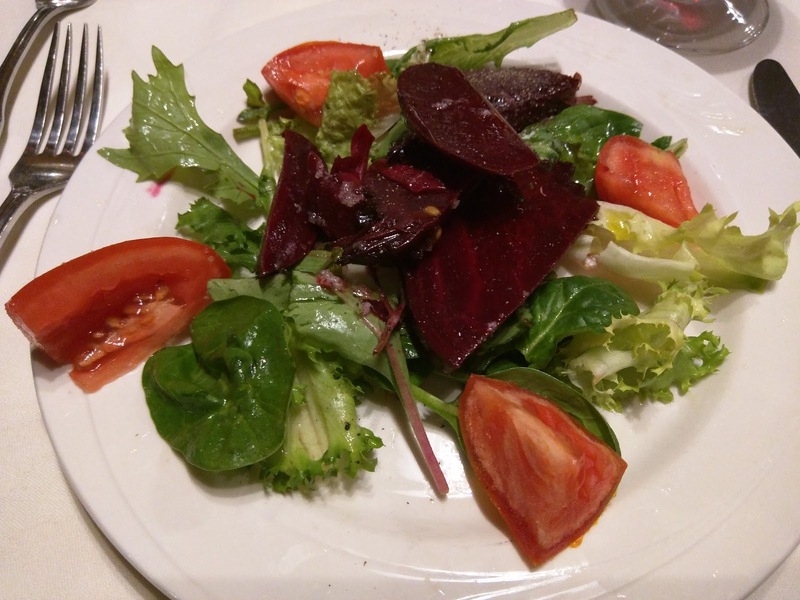 My mother and sister opted for a beet salad from the specials menu, as they had both previously tried the beet salad on the regular menu (still there, with blue cheese), and really enjoyed it. Since it had goat cheese, and I really dislike goat cheese, I didn't try it, but they both raved about it, commenting on how fresh it was and had a good tang. They thought the hard boiled quail egg on top was very cute, "a nice touch". My mom said the beets were "yummy and crispy". So, successful starter for both of them. The kitchen split it for them, so the picture above is just one portion. A full portion must have been really quite sizable, else they did a generous split, so the $10 price isn't too crazy, although I'm not sure what premium ingredient went into it. For my appetizer, I broke the mold of ordering salads, and went for a soup. Yes, I ordered soup. When do I ever, ever order soup? I don't. The thing is, I menu stalked Millstone before our arrival. The online menu said they had a "daily chowder". I was seriously, seriously craving a good chowder. I never made it to any seafood restaurants during my visit to the east coast, and missed out on getting clam or fish chowder. While I don't really like soups, a good chowder I can get behind. Rich, creamy, usually loaded with goodies like bacon ... hard to resist, particularly on a rainy night, right? Sadly, the online menu was outdated, and the chowder was replaced by bisque. Meh. Even if it is lobster bisque, I'm actually not nearly as crazy about lobster as the rest of the world. It never seems worth the premium, and generally, I actually just prefer crab. I'm spoiled living in California with fresh, local, deliciously sweet Dungeness! But anyway. The menu had a number of lobster dishes, including a lobster ravioli special, and a lobster roll that the entire table next to us ordered, so I thought perhaps the lobster would be something special, we were only an hour or so drive from Maine after all. But really what sold me was the menu description. It didn't say anything about the bisque itself. It said one and only one thing: "biscuit". I love biscuits! I figured I could order this, just to quasi-satisfy my chowder desires, get some local lobster, and, most importantly, have my biscuit. My soup arrived as you see above. I saw no biscuit. I grew concerned. Uh-oh, it didn't actually say it came WITH a biscuit. It just said simple, "biscuit", I'm the one who assumed that meant on the side, perhaps it was incorporated into the bisque itself? I lifted the lid. Hmm, no chunks of biscuit visible. I stirred it. Nothing. Was it ... blended biscuit? No way, this restaurant wasn't edgy enough for that. 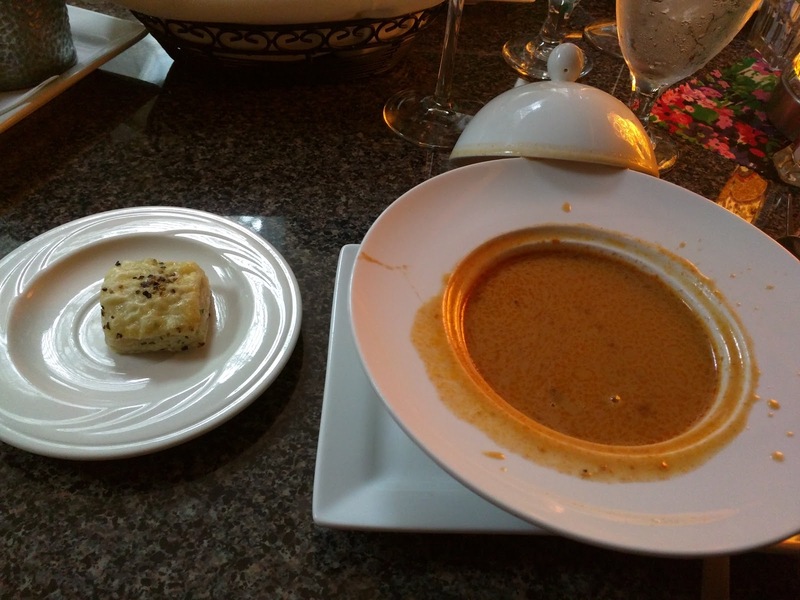 So I asked, "um, it said the bisque comes with a biscuit?" My server nodded, and said yes, it should have. Doh. Anyway, the presentation was ... trying. Arriving under a dome I guess is cute, although the server didn't remove it tableside, that was left for me to do. And, it had spilled out under the dome while being carried to the table, so it really just looked like a mess. At least it stayed warm? Bisque ... and a biscuit. A few minutes later, my server returned with my biscuit on a little plate. Unlike the soup, it was not warm. Uh-oh. Who serves a cold biscuit?! Maybe it was warm when my dish was plated, but so much time had elapsed that it cooled? I don't think so though, as it was really stone cold. The biscuit was good though. No, not an amazing biscuit, not very flaky, but it had a nice tang to it. There was cracked pepper on top, a bit too strong and overwhelming, but that pepper did compliment the soup. The soup ... was not. It was thin, watery, and I really didn't care for the flavor. Far too salty as well, although that wasn't the dominant problem. There were a few bites of stringy lobster throughout, unremarkable. $10 price for a soup with only a couple spoonfuls of lobster and a mini biscuit seemed a bit high. 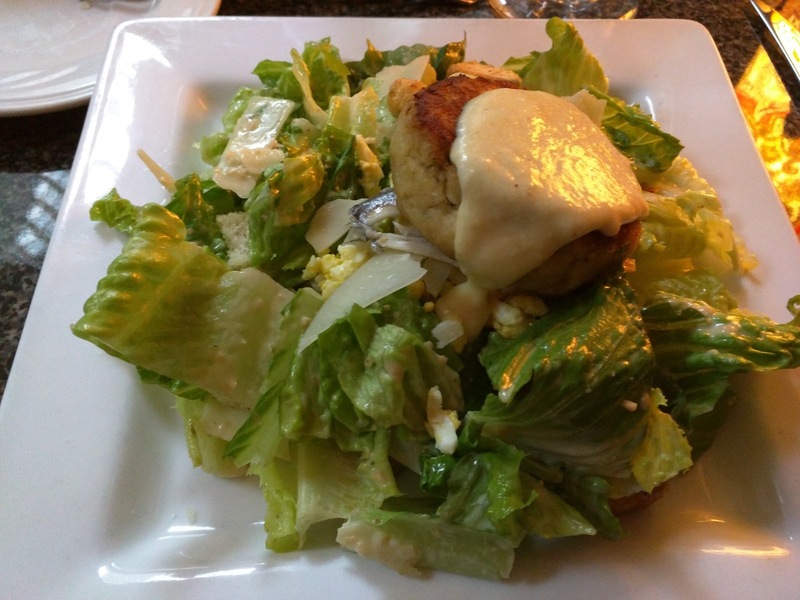 Small Caesar Salad $7 + Crab Cake $12. A few days prior, we had a caesar salad elsewhere that was supposed to be amazing, and, I really didn't like it (wilted brown lettuce, no anchovy flavor, meh, meh, meh). I was craving a good caesar salad ever since. The salad section of the menu had the tomato and mozzarella salad my dad ordered, a simple house salad, a blue cheese and beet salad, the goat cheese and beet salad special my sister and mom opted for, and ... yes, a caesar salad! I'm still not really one to ever order a salad in a restaurant given other options, but, my eyes were drawn to the small line under the salad section, listing out additions including grilled chicken, shrimp, steak tips, or ... crab cake! I love crab, and really wanted the crab cake appetizer, but no one else in my family eats crab (my dad and sister don't eat seafood, my mom reacts to crab), so I had to pass it by. I decided to go for the caesar and top it with a crab cake, making it into an entree. The waitress didn't seem to have a problem with this. I'm including it here in the "Appetizer" section of my review since it was technically an appetizer, but, it was delivered with the other mains as my main. The salad was available in two sizes, one for $7 and one for $9. I opted for the small one, knowing I'd be sharing things with the others too. It still seemed like a very large salad, so I'm curious how much bigger the $9 version was. Or, perhaps they made me a large one anyway, since I had it as a main dish? Anyway, the salad was better than my previous caesar, but not remarkable. Fresh enough romaine formed the base. It had large shreds of parmesan. Lots of croutons, made of assorted breads, really crispy and very generic, like any croutons from a bag. There was randomly some bits of hard boiled egg. The dressing was good enough, but it was really inconsistently mixed. Some bits were way overdressed, others had no dressing. When I ordered, I was asked if I wanted real anchovy, and of course I said yes. Under my crab cake I found my anchovy, a single white anchovy, split in half. It was the best part of the salad, just an anchovy, but I do love the flavor of them! As for the crab cake. It was awful. Truly awful. Not crispy on the outside at all, even though it was browned. Just a big pile of mush. Fishy tasting mush. No lump crap meat, lots of filler. The texture was awful. I tried a few bites, really trying to reset my expectations and not waste crab, but, wow, this was definitely the worst crab cake I've ever had. My mom took a bite, I think assuming I was just being a snob, and immediately agreed that it was just mush. Horrible. I did make one other modification to my salad. The aforementioned crab cake appetizer that I had wanted to order came with a "popcorn sauce". I really wanted to try that, so I asked for it to come with the crab cake on my salad too, which they accommodated. The popcorn sauce was as fascinating as I thought it would be, creamy, and flavorful, although, I'm not really sure it went with crab. I appreciated trying it though. 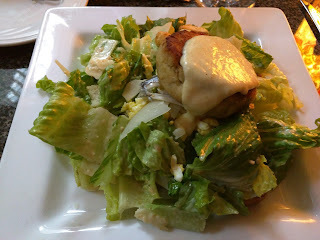 So, overall, a highly mediocre caesar salad and the worst crab cake of my life. $12 for just that single pile of fishy mush is way too high, but $7 for a salad was ok. The main dish section is broken up into entrees and casual sandwiches. The entree selection included a bit of everything: baby back ribs, steak tips, filet mignon, lamb chops, and meatloaf for the meat eaters, salmon and red snapper for the seafood lovers, and a chicken dish for the poultry fans. A token vegetarian pasta rounded out the entree list. An additional 5 entree specials were lobster ravioli, veal cutlet, halibut, pork tenderloin, and a NY strip. Clearly, this is not the place to come if you are vegetarian. Almost all the entrees came with mashed potatoes. Additional sides were available including frites, "vegetable", and "mushrooms". The sandwich lineup included a reuben, chicken, and lamb option, plus a token burger and lobster roll. "Tzatziki sauce, house made pickles, lettuce, roasted tomato, naan bread." My sister picked the lamb gyro from the sandwich menu. When the server came to take our drink order, my sister asked the server what cut of lamb it was. The server didn't know, and said she'd come back to let her know. When she returned to take our dinner order, she hadn't found out. She didn't offer to check then either, and when my sister pressed, she said she'd return with the information ... after she ordered. She was trying to find out so she could order! Anyway, it was ground lamb. My sister liked this more than anything else she'd had previously at Millstone, and in particular, said the tzatziki was good. Since I really don't like lamb, I didn't even try a bite. She had her choice of pomme frites, napa cabbage slaw, or fresh fruit as an included side, but choose to upgrade to the sweet pomme frites for $2, pretty much at my insistence. I had been eying them on the sides menu the moment we sat down, and wanted someone to order them, or to get an order for the table as an appetizer perhaps. She hated them. I thought they were ok, but I understand the disappointment. First, they were mixed with regular frites. Only about half sweet potato. This isn't mentioned on the menu, or in person when you order the sweet ones, kinda lame. Second, well, they were frites, so they were super thin and crispy, and she wanted thick wedges. That said, they were nicely salted and decent for a thin, crispy style fry. No offer of ketchup was made to go along. I flagged the waitress down to ask for it on my sister's behalf. Many minutes went by. She keep waiting, the fries getting cold. More time went by. 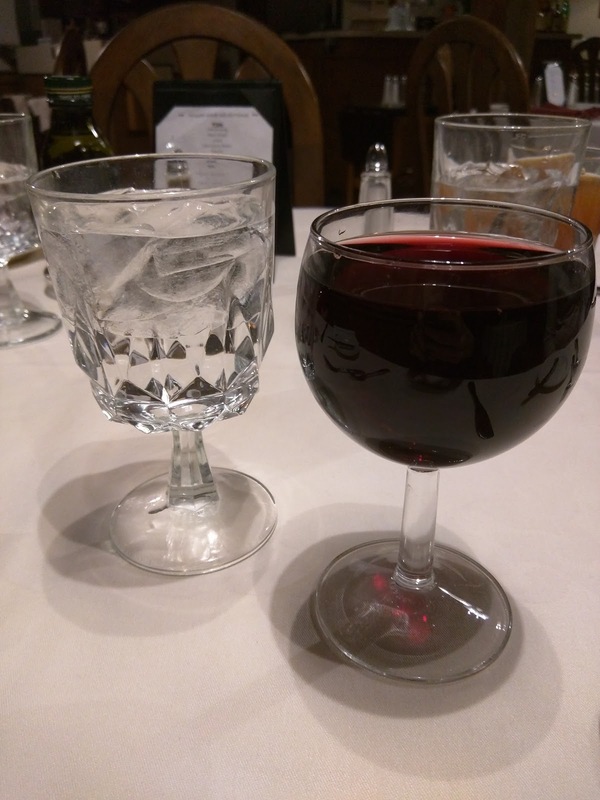 The waitress returned with my mom's wine (ordered long before, my mom had already decided she didn't even want it at this point), and I questioned about the ketchup. She didn't even seem to remember that she'd promised it earlier. Sigh, the service. $12 price was fine for fancy sandwich. "Bacon, ketchup onions, mashed potato, bordaliase." My father doesn't eat many things, so the fact that he found an entree that he was willing to order that wasn't just a pizza, a burger, or simple pasta dish was pretty shocking. Because ... they had meatloaf! It also turned out, he picked the best dish, no question. He isn't really one to share, but, it was my last night there, and how could he deny me? 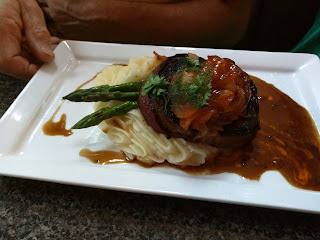 The meatloaf was moist and flavorful, infused with plenty of bacon flavor. On top was tons of caramelized onions that added additional flavor. Really quite good, but, why, oh why did they garnish it with dill? Random. It was served over a couple asparagus spears, which seemed to be the side of the day, as his plate came with two, and my mom's had three. He doesn't eat asparagus, so he offloaded it to my mother, who proclaimed that it was "perfect, not overcooked, not too crispy". There was also some piped mashed potatoes, again, trying so hard with the presentation! They were creamy and good enough I guess. $16 for a large portion seemed fine, and, as I said, best dish of the night, and my second favorite bite of the night was a chunk of his meatloaf with plentiful onions. "Miso glaze with sesame and ginger, jasmine rice, butter sauce." My mom opted for the salmon from the regular menu as her main. 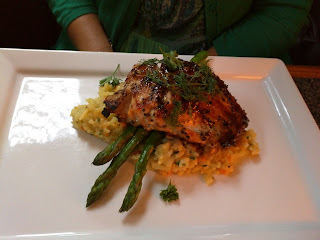 I secretly hoped she'd go for the halibut special, since I intended to snag a few bites, and I like halibut more than (cooked) salmon, but, she loves her salmon, and rarely gets to eat seafood since no one else in my family does, so her mind was made up immediately. I of course still took some, as even though I don't love cooked salmon, who can resist miso glaze? I love miso! The salmon was decently prepared, a nice sear on top, served skin on. Cooked fully through though, and the only way I really like my cooked salmon is mid-rare. That said, it was fairly moist. The miso flavor wasn't that strong, but it was well seasoned. It was a bit fishy. It was served over a few spears of the same asparagus that came with my father's dish, and rice that I didn't try. And garnished with the same parsley and dill. The plating looked nice I guess, albeit dated. Overall, a decent enough dish, and if I liked fully cooked salmon, I likely would have been satisfied. My mom did really like it. $24 is a high price for a restaurant in that area though. After a disappointing meal, I still had a glimmer of hope when I saw the dessert menu. Lots of tasty sounding choices, plus, you know me and desserts. And my family is full of sweets lovers, so I figured that the four of us would at least 3 to try. And then, my mom declared that she was full and wanted nothing. As did my dad. Hmmph. And my sister wanted one and only one thing, and she seemed to want her own. Ooph. The dessert special of the day was an unceremonious lemon pound cake with berries and whipped cream. Other options included chocolate mousse pie, chocolate lava cake, and tiramisu, all of which sounded great, but I had to avoid due to caffeine. There was also a daily sorbet, and assorted ice cream from Walpole Creamery. I obviously love ice cream, don't get me wrong, but this is never what I order in a restaurant. Maybe I should have. We settled on the other two selections, with the thought that I could take some home if everyone else was really unwilling to help out. We did have plenty left, but, I didn't want to take any home, as they desserts matched the rest of the meal: overpriced, and not very good. I started with a decaf coffee, as I always like a bitter pairing with my sweets. 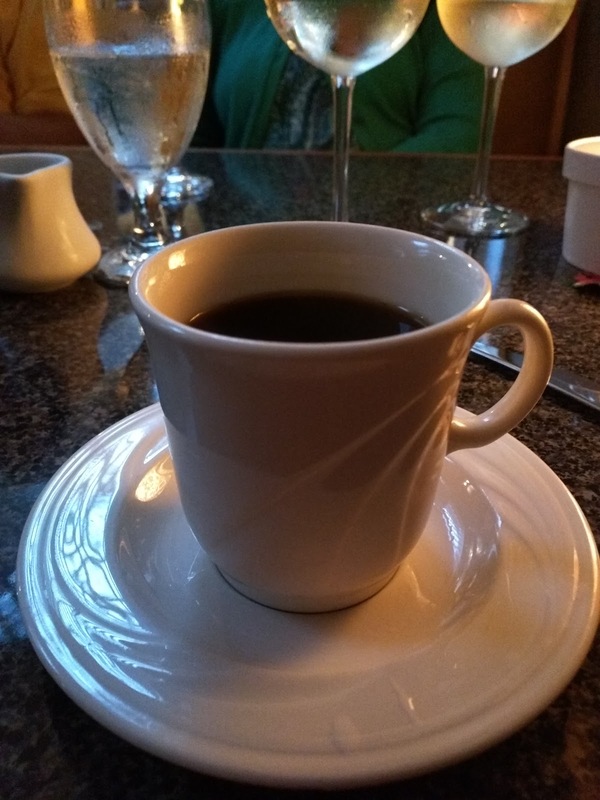 It was served with a little pitcher of creamer. Sugars were already on the table. It was fine. Not remarkable, served in a slightly small cup, but, fine. As I mentioned, my sister wanted one and only one thing: the creme brûlée. 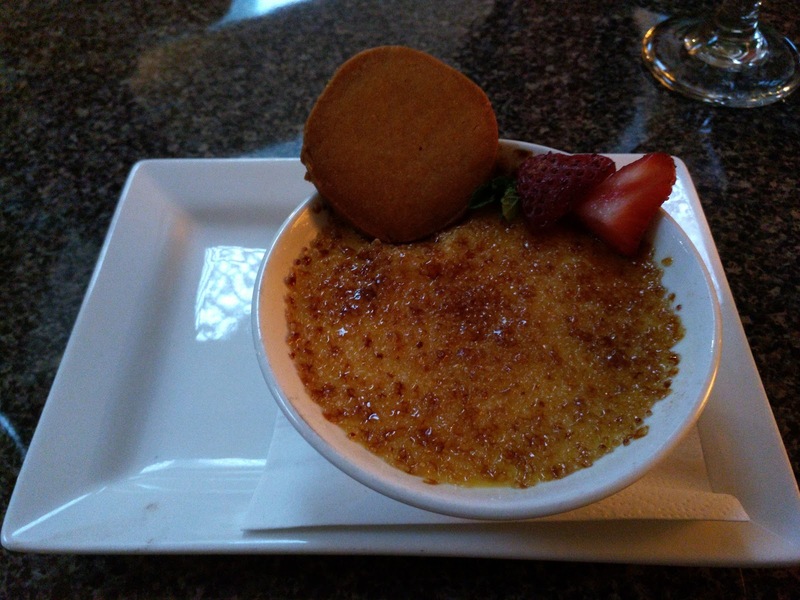 Now, you know how much I love puddings, and creme brûlée specifically, so I wanted it too. She said she'd share a few bites, and even stepped back to let me perform my standard creme brûlée eating procedure. I started with the "tap test". The caramelized layer on top was thin, but it did have a good flavor, slightly burnt in a good way, and seemed to have been freshly torched to order, as the custard was cold, and top a bit warm. So not as thick as I wanted, but decent enough. The custard itself had a nice creamy consistency, but tasted like ... nothing. It just had no flavor whatsoever. Sadness. After a few more bites, I gladly let my sister have it, even though it ended up being the better of the desserts. The garnishes on the side included a "vanilla bean shortbread cookie", that somehow wound up in my dad's hand within moments of it arriving on our table. I don't like cookies really, so it isn't like I wanted it, but I did want a taste! Oh, an a totally unripe sliced strawberry. Meh. The $6 price tag however was quite reasonable for a dessert at a restaurant with this pricing. Peanut Butter Banana Cheesecake. $8. The other option I went for was the cheesecake. Now, I'm not necessarily a huge cheesecake lover, but, I do like cheesecake from time to time, and it tends to be something that most restaurants can do well (or, they purchase it from somewhere frozen, and that works too). Plus, peanut butter? Yes! Sadly, it was just as lackluster as everything else. The cheesecake wasn't creamy. It didn't have any cream cheese flavor to it. I did like the peanut butter, but it was overwhelmed by banana. The top was burnt. 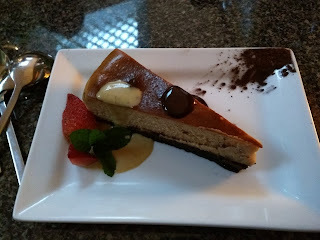 The crust was a "chocolate cookie crust" and was actually tasty, but it was very thick, and it was hard to cut a chunk of cheesecake off that would have both the filling and the crust. After a few bites of the cheesecake, trying so hard to like it, I gave up, and ended up just eating cookie crust, chocolate and all, because I wanted something to satisfy. Sigh. It was garnished with another unripe strawberry, and a pudding of some tasteless sauce. This was worse than the creme brûlée, and the $8 price was high compared to other desserts on their menu. I visit New Hampshire about twice a year to see my family, usually once in the summer to enjoy warm weather, and once in the winter for Christmas. On every visit, we try to go out to dinner somewhere with my sister near her house in Andover, NH. This is an area even more rural than where my parents live, and the options are extremely limited. 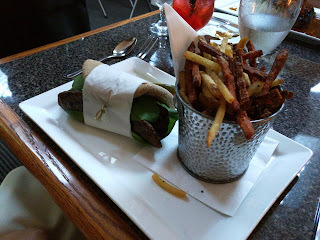 My sister's favorite place is The Flying Goose, where I've never liked anything but the sweet potato fries. I really didn't want to go back there again. So this year, as always, my mom picked me up in Boston, and wanted to stop to meet my sister for dinner on the way home. My sister of course proposed The Flying Goose, and I groaned. There *had* to be other options, right? I did some digging, and pretty much found nothing. Then she sent me a link for La Meridiana Restaurant. She'd never been there. She didn't really know anyone else who had either. But it was located literally 4 minutes down the road from her house, and she drives by all the time, and was curious. I looked it up. What I found was ... interesting. La Meridiana has been around for nearly 30 years. 30 years! With the same chef, Piero. At one time, it seems to have been a full service, regular restaurant, with a staff. Now ... it is Piero. Only Piero. He answers the phones to take reservations. He greets you when you enter. He waits on your table. Once he gets you settled with drinks, he takes your order, and then he goes out back to cook your food. He brings it out when ready, and clears your plates when you are done. Just Piero. His restaurant. And, well, he makes the experience. Was it amazing food? Not really. But he was an amazing host. It felt like we were welcomed into someone's home. Oh, and the part I didn't mention yet? It is open by reservation only, and, well, doesn't exactly get a lot of business. We were the only table for the night. Literally. So yes, he opened up his restaurant, just for us. The "Daily Specials" menu that was printed out, with the day's date on the top, was just for us. It was quiet (sans the Christmas music he had playing), and we were able to talk without any noise or distraction, which is exactly what we wanted, since I hadn't seen my sister since her wedding the previous summer, and had only seen my mom the past two hours on the drive. La Meridiana and Piero provided a truly memorable meal, not for the food necessarily, but for the entire package. I recommend it to anyone in the area, and would gladly return. We had a long, satisfying meal, in a comfortable space, prepared by someone who was clearly doing it because he loves it. Oh, and the prices? Ridiculously reasonable. We pulled up outside the restaurant, not quite sure what we were getting into. It looked charming on the outside, all lit up with Christmas lights, but, there were no other cars around, and we were in the middle of no where. What were we getting ourselves into? 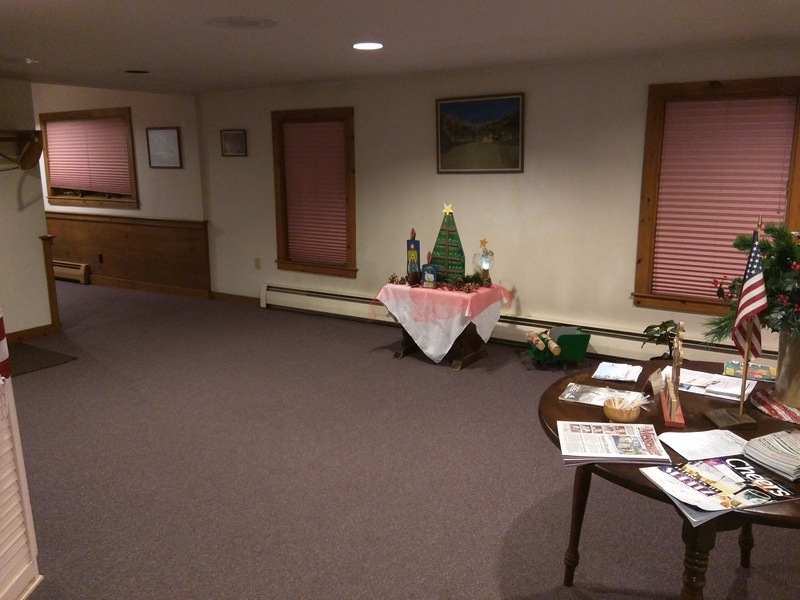 We walked in to find a very spacious entryway. We paused, unsure of where to go, or what to do. There was a hallway ahead, so we started down it. At the end of the hall was the dining room. 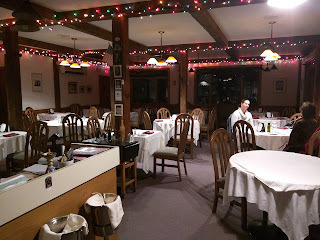 A charming space, with wooden tables and chairs, exposed wooden beams, and cheery Christmas lights. The windowsills had pine cones, and other seasonal items, as decorations. There was a fireplace along one wall, but it was not on. It wasn't a huge space, probably only 10-12 tables, but, as I said, we were the only table seated that night. We were given a prime table, right near the window. At the front of the room is a wooden bar, stocked with hard alcohol, bottles of wine, and an espresso machine. Did I mention this place has some serious charm? 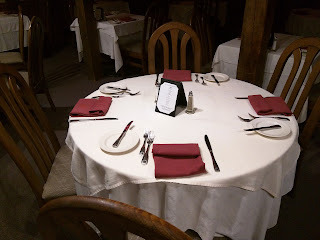 Tables were set with white tablecloths, red cloth napkins, classic, older style silverware, and bread plates. We were handed menus, and settled in to read them. This was quite the endeavor, given the length of the menu. Pages and pages. Antipasti. Soups. Salads. Pasta. Seafood. Meats. Specialties. Daily Specials. Yes, these were all different sections. "These dishes are specials in many ways; from people whom I respect and they are prepared in slow preparation/cooking, the old fashion manners! When, human beings enjoyed and savored their meal prepared specially for them, in gratitude. If you are not able to wait for the finish dish, please order something else. Thank You!" I thought that was incredibly charming as well, and immediately set out to order at least one of the Specialties. On our tables was a menu with wines by the glass, half-carafe, or carafe. Prices were ridiculously reasonable, and there were many options for each type of wine. I believe there were beer options too. The daily specials menu also included some alcohol free beverages, such as San Pellegrino (plain or flavored), flavored Vitamin Water, flavored Spindrift sodas, fresh apple cider, and strawberry lemon and limeade. My mother and I both opted for glasses of wine with our meal, I went for a red (Chianti), she went white (Riesling). Both of us received ridiculously large pours. Seriously, look at how full my glass was. And, uh, it was $5. $5! Ok, a $5 glass of wine, at a restaurant where we were the only diners, no way this was going to be good, right? Probably poured from a bottle opened days ago, the last time a diner decided to get some Chianti? Probably not a quality bottle in the first place, right? I was wrong. It was good. I really liked it. Not too big, not too tannic, but fairly complex, and it went great with my meal. Also, seriously, $5 for this pour? The starters section of the menu has several sections: Antipasti, Soups, and Salads. There are additional starter items on the Specialities section AND more on the Daily Specials menu. So, lots of choices. The Antipasti options included beef carpaccio, prosciutto, sautéed chicken livers, steamed mussels, and garlic butter snails. Soups were classics: minestrone, chicken, or split pea. Salads included several different mixes with house made dressing. There were also options on the Specialities menu, such as steamed artichokes and Caesar salad. The daily specials included more salads, steamed broccoli, sautéed mushrooms, polenta, and wild boar pate. We opted for two salads, one from the daily specials and one from the Specialties. My mom and sister wanted a beet salad, which I was happy to pass on, and we all wanted the Caesar. My sister ordered, saying "We'll share a beet salad", and then she paused, looked at me, and asked, "and you want the Caesar then too, right? ", since I was the one pushing for the Caesar. I confirmed. We thought we had ordered one beet salad and one Caesar salad, which would be placed in the center of the table, hopefully with some share plates. Spoiler: that isn't quite what happened. As our salads came out, a basket of bread arrived as well. I generally skip bread baskets, but, I'm very glad I didn't skip this one. It was a stunner. I was blown away when I pushed aside the cloth napkin to reveal the contents. There was not just one type of bread in there, nor two, nor even three. There were 5 different types of bread, all hot and fresh! On the table was a bottle of olive oil, and a basket with both butter and margarine packets, to use as we desired with our bread. I started with an onion studded roll. It was fantastic. Dense, doughy, warm, and loaded with onion flavor. It didn't need to be dunked in oil, nor slathered with butter, it was great just on its own. We all enjoyed our chunks of this and agreed it was great. Next I moved on to the dark roll you see in front. It too was ridiculously light and fluffy, with a slightly crusty exterior. It had a nice depth of flavor, and was excellent with the butter. I skipped the next two options, both types of white rolls, crusty. My mom and sister enjoyed these. The final option was a sliced bread, that I also planned to skip. We had pasta coming, why on earth would I fill up on bread? But I still couldn't believe how good the other bread was, and my sister took one bite of the sliced bread, and proclaimed it the best, and broke off part of a piece for me. It was a fluffy brioche, slightly sweet, shiny on top. It was great. The bread basket really was stunning. This was no generic bread, it was all hot and fresh, and all quite delightful. I'm not sure where the bread came from. 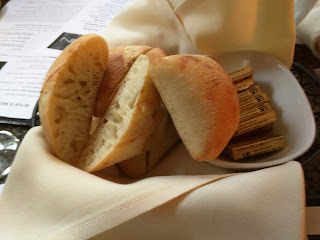 Piero clearly didn't freshly bake 5 types of bread, just for us. But it also wasn't remotely stale, and couldn't have been baked less than a day before. Regardless, this was a truly wonderful offering, and I don't understand how he manages to do this at such low volume. 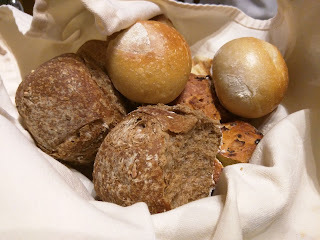 After we finished our meal, we still had some bread left in the basket, including a few slices of the brioche. My sister asked him to package it up for us, saying that I loved the bread. I laughed, but said that I would indeed take it, to make a bread pudding. When I opened the leftovers bag at home later that night, I had a wonderful discovery. He didn't just give us our leftover bread ... he gave me an entire loaf of brioche! "Fresh local beets baked & marinated with herbs, cold press olive oil, red wine vinegar, shallots, salt." 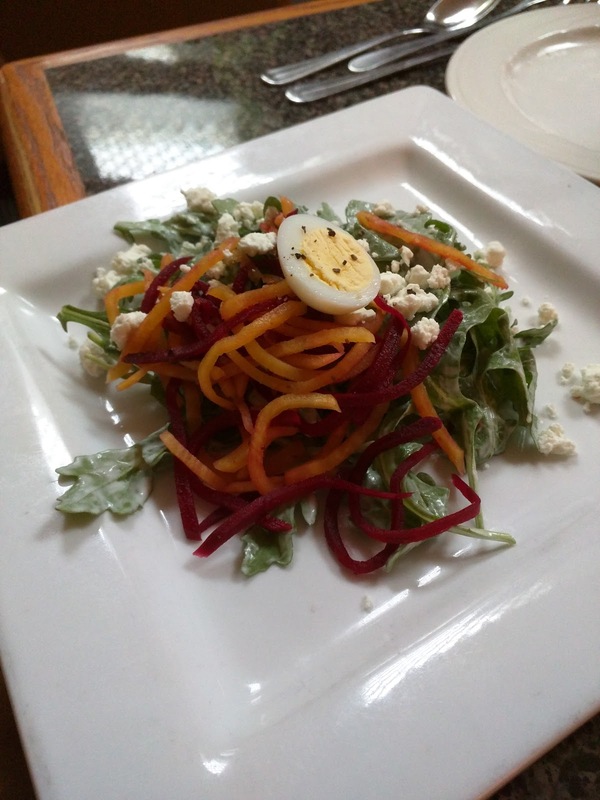 My mom and sister are crazy about beets, so they really wanted the beet salad. I had no interest in having any, and told them that. When my sister ordered, she said that "we'd like to split the beets", gesturing at my mother. So we were a bit surprised when three beet salads were brought to the table, one placed in front of each of us. The salad was a mix of greens, assorted baby greens, spinach, and frisee, all fresh and crispy. There were large chunks of out-of-season tomato, and marinated beets, all drizzled with olive oil, and seasoned well with salt and pepper. I had a few bites of the greens, but, besides being fresh, there wasn't much interesting there. No one liked the tomatoes, but my mom and sister both really loved their beets, and gladly took the ones left on my plate. The portion looked a bit small for $9, and we didn't think we ordered three of them, and it turns out, we didn't. We were charged for only one, but he split it onto three plates for us. That made this a $3 salad, and the regular size must be crazy huge for $9? I think he must have given us more than usual, making this a tremendous value, and a dish my mom and sister were both quite thrilled with. 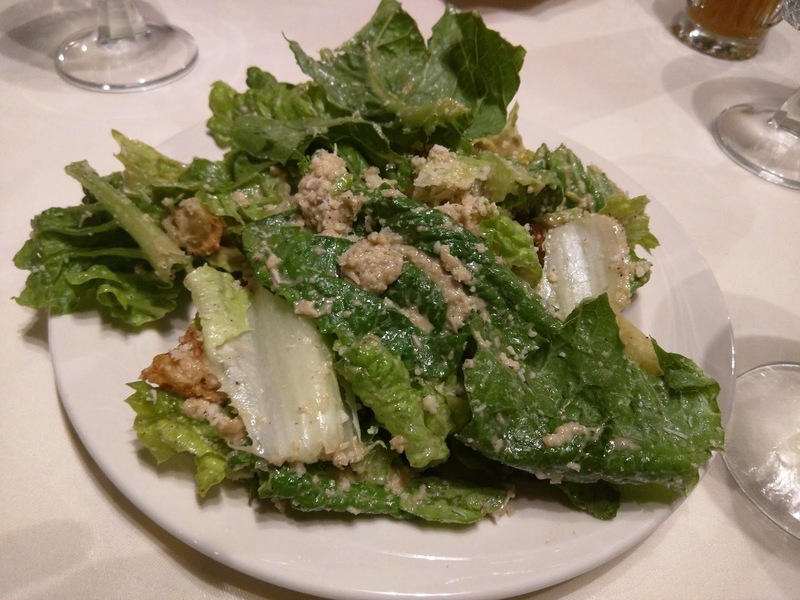 "Prepared to order; Romaine, our homemade dressing, anchovies, mustard, canola oil, Worcestershire sauce, juice from fresh lemons, red wine vinegar, homemade croutons, Romano cheese, fresh garlic, Our version of the classic! Thanks’ to Mr. Waldemar New York 1973." The other salad we ordered was the Caesar, from the Specialities section of the menu. When she ordered this, my sister turned to me and said, "and you want that Caesar to come with the beets, right?" I said yes. After we were each brought a plate of beet salad, a single Caesar salad was placed in the middle of the table. Why he choose not to split this one, I'm not sure, but it was fine, and what we had intended in the first place. The salad was fine. Basic romaine, including hearts and leaves, croutons, cheese, and dressing. The dressing wasn't a creamy, thick style as I prefer, but instead was a tangy version, made with oil, red wine vinegar, lemon, garlic, mustard, and I think anchovies were in here too. I didn't particularly taste anchovies, but, the menu description did say they were in there somewhere. The mustard was a bit strong for me. The cheese was grated cheese, rather than shredded or large flakes as I prefer. The croutons weren't remarkable, but my sister commented on how great they were. So overall, this was fine, but not really my style. I want a creamier dressing, large shreds of cheese, and visible anchovies. But that might just be me. The $9.25 price was fine for a decent size salad. The main dish portion of the menu also has many sections. The first is pasta, where my eyes immediately gravitated. It had all the classics: tortellini, spaghetti (vegetarian or meaty bolognese), ravioli, gnocchi, agnolotti, and even crespelle (crepes). The gnocchi in particular sounded great, made from Piero's mother's recipe. Next came pesce (fish and seafood), with salmon baked in parchment paper, shrimp scampi, trout, and baked cod (another one made from his mother's recipe), with cream and shallots. You can guess which of those called out to me. Then came the meat, with veal scaloppine, beef tenderloin, chicken cacciatore, rack of lamb. I easily looked past those. Next, a set of "Specialties", again with warnings about preparation time, and included veal chops, stuffed beef, and risotto. All fish and meat main courses come with vegetables and roasted potatoes. 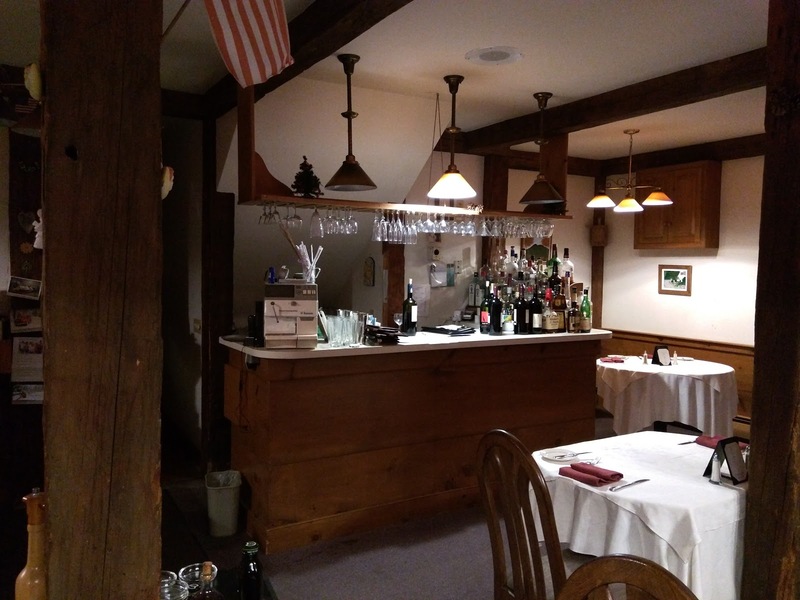 Then there was the Daily Specials, which came printed on the dated separate menu featuring two more types of ravioli (5 cheese or lobster), pork scaloppine, and rib eye. We planned to share all our dishes, but no one else in the group wanted seafood, I didn't really want meat, so, we were mostly looking at pastas. The carbonara was easily agreed on by everyone. I pushed for the gnocchi, but my sister really wanted risotto, as did my mom. Since I wasn't that hungry, I agreed with this plan, and told them I didn't really want risotto, and would mostly just have some carbonara. My sister again ordered for the group, saying we'd all split the risotto and carbonara. She finished her salad first, and her plate was cleared away. My mom and I both still had salad plates in front of us. The server/chef came out with a plate of risotto and placed it in front of my sister. He also had a bowl of carbonara, which he also placed in front of her, slightly to the side. The portions weren't tiny, but they didn't quite look sharable by 3 people. We were a bit worried that we had miscommunicated our order, and this is all we were getting. Then he returned ... with two more plates of risotto and two more bowls of carbonara, placing a set in front of both my mother and I. We really thought we'd just get a big bowl of pasta and a big bowl of risotto, with some share plates, and each take what we wanted (with me not really having the risotto). Now I had a serving of risotto sitting in front of me, and a nice man watching expectantly as we dug in. Guess I had to go for it. We also figured at that point that we'd totally miscommunicated when ordering, and he thought we wanted 3 orders of everything. But ... no. He charged us for only one risotto, only one pasta. He split it all onto separate plates, but there is no way that this was a single portion, split 3 ways. What a generous man! "Made with Italian rice, saffron, wild porcini mushrooms. olive oil, shallots, Romano cheese, homemade chicken stock, finished with butter (mantecato). My mother taught me to prepare it, at a very young age, ancora Imparo! (I’m still learning) I used to start the risotto, and my mother, coming home from the field she finished this delicious dish. AHHH Buon Appetito!" 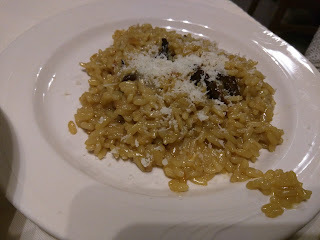 So, the risotto, from the Specialities section. Like I said, I didn't actually want the risotto, but, I was given this portion. I tried a few bites. I guess it was fine, but, well, it was flavored rice, just not my thing. My mother and sister both liked it, my sister saying it was the highlight of the meal. It was topped with fresh shaved cheese, had a few scattered mushrooms throughout, and was piping hot. My mom said "it is creamy, and not mushy". I guess that is a good review? This portion might have been a bit small for $20, but, if you triple it, then the portion would have been insanely large. 3 plates this size for $20 was crazy cheap, and can't possibly be what he normally serves. This had to at least been a double order? Pasta: Fettuccine Carbonara. $17.95. (1/3 portion). "Flat noodles boiled, finished and cooked with pancetta, garlic, egg, cream, Romano cheese, salt and pepper." 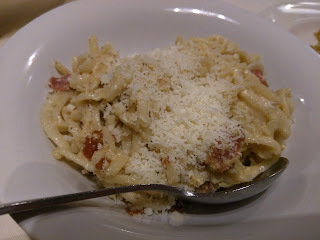 The fettuccine carbonara was my pick of pasta to order. It came served in a bowl rather than a plate, with a spoon for twirling action, and fresh grated cheese on top. It was ... fine. The noodles were overcooked, rather mushy. The sauce was ok, a bit creamy, decent flavor, nice pepper level. My mom was impressed at how well integrated the sauce was, and how it didn't break. She said it was her favorite. I really did like the bits of pancetta, salty, crispy little bits of goodness and the nice seasoning job. I felt the same way about this portion size as the risotto. Many restaurants in San Francisco could give you this portion for $17.95 and it would be normal. The portion would probably be seen as a bit small, but honestly, it was plenty. And if you consider this only 1/3 of an order, then it is crazy. I really have no idea what a normal portion size is, but, he only charged us for one, and we each had full small bowls of it. And now, the moment I am always waiting for: dessert! The entire desert menu is listed on the daily specials menu, so I saw it at the start of the meal. In fact, I told the server/chef that I was saving room for dessert because I wanted it all, and he told me I was welcome to start with dessert if I wanted. Believe me, I was tempted! It was a cold winter night, so I ruled out all the frozen options, but there were three flavors of sorbetto (mango, blood orange, raspberry), five flavors of gelato (vanilla, pistachio, hazlenut-coffee, coconut, espresso), a single flavor of ice cream (pumpkin), two sundaes (a "Nutty Sundae" made with pistachio gelato, topped with walnuts, hazelnuts, almonds, honey and whipped cream, and a "Espresso Sundae" with coffee ice cream, espresso syrup, chocolate beans, and whip), and a frozen White Chocolate Mousse Cake. Yes, I ruled out a lot, but there were still plenty of other options. I wanted the carrot cake, always a favorite of mine, but it was made with coconut, and my sister is allergic, so she wouldn't share that. Cannoli came filled to order, but I don't like citrus flavors in my desserts. Now we were down to three: ricotta pie, chocolate cookies cheesecake, and wild blueberry pie. My mom voted out the ricotta pie, so, the other two it was. My sister took charge of the ordering, saying "I'll have the cheesecake, and they'll share the blueberry pie". Now, really, we had discussed all sharing both, with the understanding that she wanted more of the cheesecake, but I kinda laughed when she ordered it that way. Of course, we didn't realize the implications of her order until the dessert came out a few minutes later. Like other sections of the menu, I wondered how he could possibly have all these dessert freshly made and available. Sure, the frozen items could keep in a freezer, but what about the rest? I'm pretty sure that they actually are all frozen, and he just warms the pies and cakes up. The cannoli are likely the only item freshly made, and I'm guessing the shells are frozen for those, just the filling is made to order. Anyway, dessert didn't take long, and was a nice sweet finish to our meal. Of course, I like coffee to go along with my dessert. 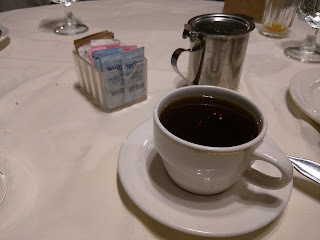 There was no coffee nor tea on the menu, and no offer of any other beverages was made, but I asked anyway. And, I wanted decaf. I assume a restaurant this small wouldn't have decaf, but, hey, you never know. Sure enough, he said he had decaf coffee and could brew me a pot. He also had an espresso machine and could make whatever espresso drinks I wanted. I opted for just the coffee, and, indeed, he did brew me an entire pot. He kept my mug refilled the rest of the night. The coffee was fine. It was decaf, but wasn't funky or old tasting, and really had a nice, pure flavor to it. Well, huh. No idea what brand it was, but, really not bad. It was served with assorted sweeteners and a pitcher of creamer. My unlimited refills cup was only $2. Dolce: Chocolate Cookies Cheesecake. $5.00. "Cream cheese, sugar, wheat flour, chocolate & egg." The first dessert was brought out, the cheesecake, and was set down directly in front of my sister. It was for HER after all, per her order. I wasn't that excited about it anyway, but did try a bite. It wasn't great. The graham cracker crust was soggy, which made me think it had been defrosted quickly for serving. The cheesecake was a swirl of plain and chocolate cookie cheesecakes, and wasn't particularly creamy, nor cream cheesy. It really just wasn't anything special at all. It was garnished with a few squirts of whipped cream, clearly from a can. The slice was very generous, a real "Parent family wedge", a ridiculous value for only $5. 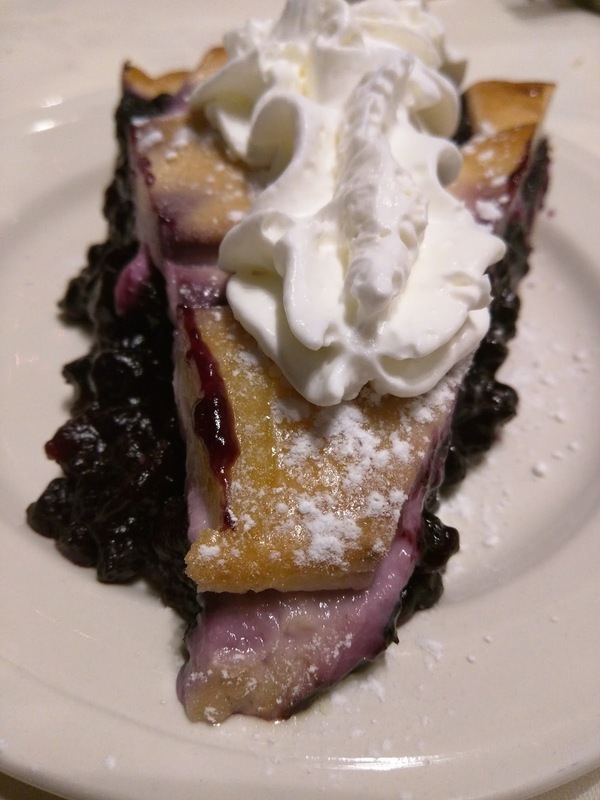 Dolce: Wild Blueberry Pie. $5.00. (1/2 portion). "Maine wild berries, flour, sugar, butter & spices." My sister had said that my mom and I were sharing the blueberry pie. 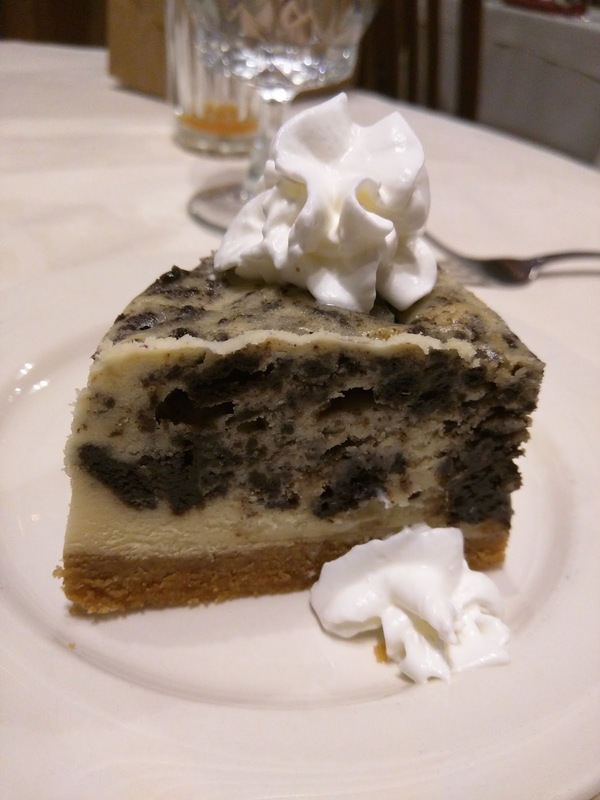 We expected that we'd get a slice of the cheesecake and a slice of the pie, and three forks, and share was we wanted. As you saw, my sister got her slice of cheesecake. And then ... my mom and I both got our own slices of pie. Full slices of pie. It is a bit hard to see in this photo, as the slice actually looks rather narrow, but it really was massive, and in particular, seemed to have been cut from a pie with a really large diameter, as it was much longer than a normal slice. Anyway, the pie. It had a full crust on the bottom, lattice on top. It was not a flaky pie crust. It is a bit hard to describe the style of the crust actually, it wasn't bad, but it certainly wasn't a standard pie crust. It did have a slight gumminess to it, it was somewhat doughy, and again I think this was due to being defrosted and heated up. Oh, and it was served lukewarm. At first, I thought it was hot, or at least warm, but it turned out that only the edge was. Inside was stone cold. Again, indicators that it was frozen and rapidly heated. The filling was sweetened little Maine blueberries. It was good. It wasn't too sweet, it wasn't too tart, it wasn't too gooey. Not remarkable, but not bad. Which is how I felt about the pie in general. Was it amazing? No. But it wasn't bad. Like the cheesecake, it was served with canned whipped cream. I easily finished my massive slice, and part of my mom's too. The $5 price was fine for a slice, but, we also weren't charged for two slices. I find it unfathomable that he'd normally serve a single slice that was twice this size, not only because of the price of only $5, but, really, that would just be an insane serving size. He really must have just given us each a full size slice ... right?